Layer the watermelon, yogurt and granola and top with yogurt and watermelon chunks. 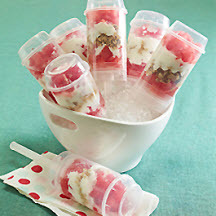 Freeze push pop molds and enjoy breakfast when you're on the go! *Molds are sold at most restaurant supply stores.